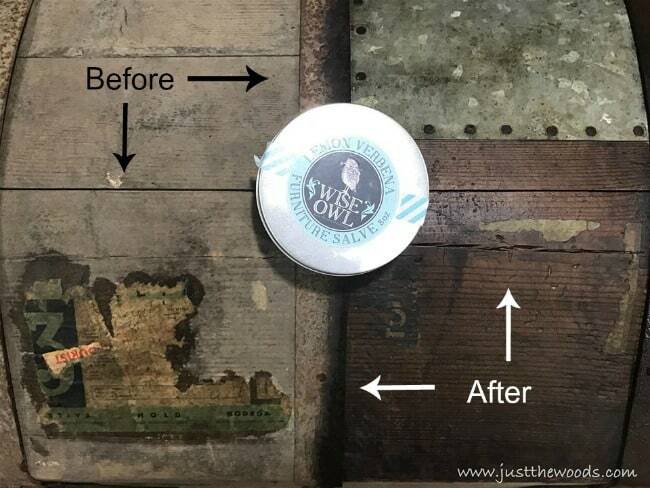 Steamer trunk restoration project, remove mildew odor, secure old labels and learn How to Restore an Old Steamer Trunk in a Few Simple Steps. 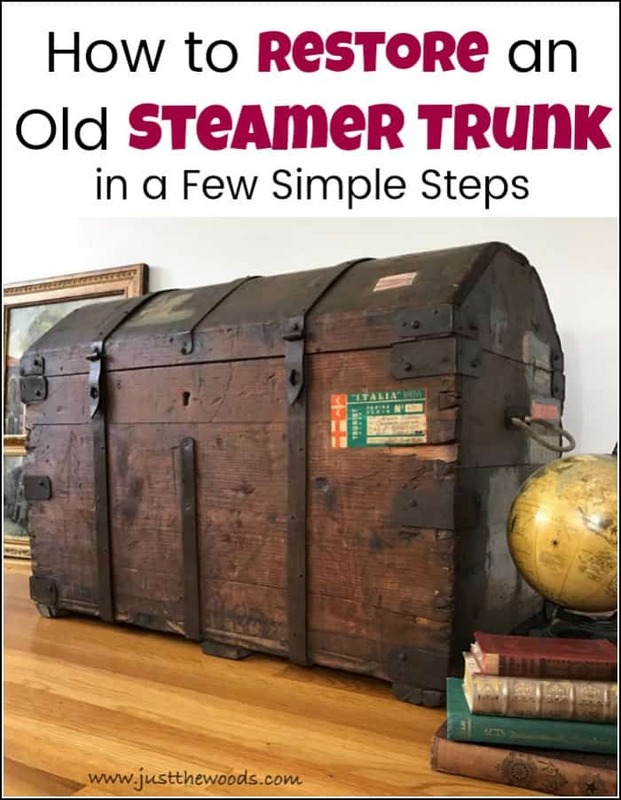 Have you heard of steamer trunks? 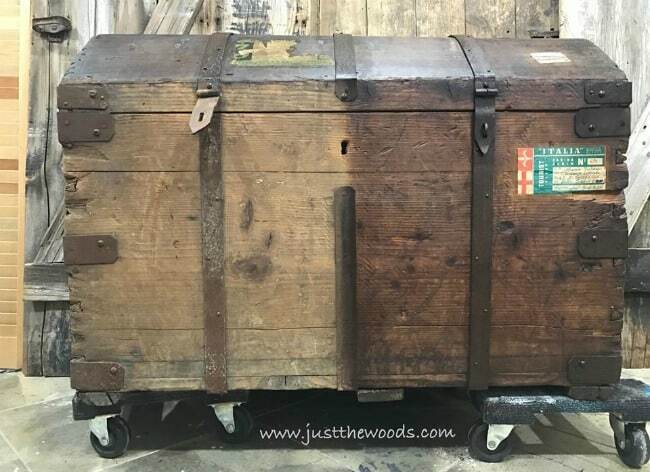 Have you ever wondered what is a steamer trunk or what makes it different from any other wooden trunk or chest? 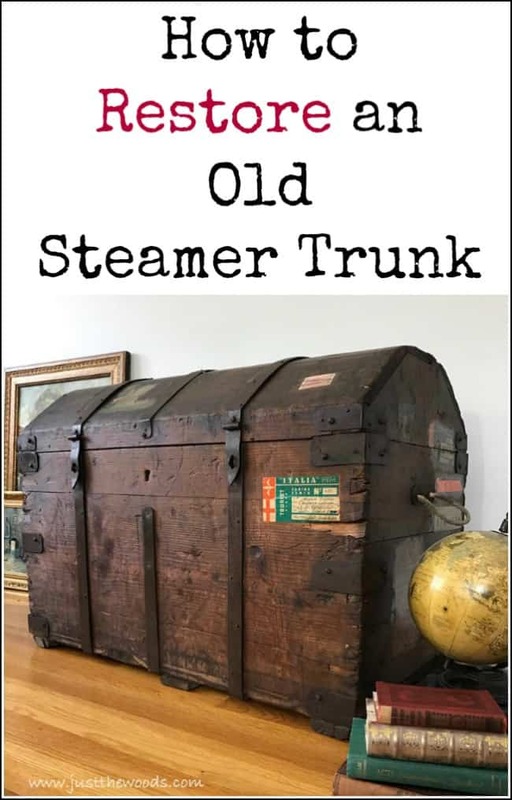 A steamer trunk actually got its name because it was designed to be used aboard a steamship, also known as a “steamer”. 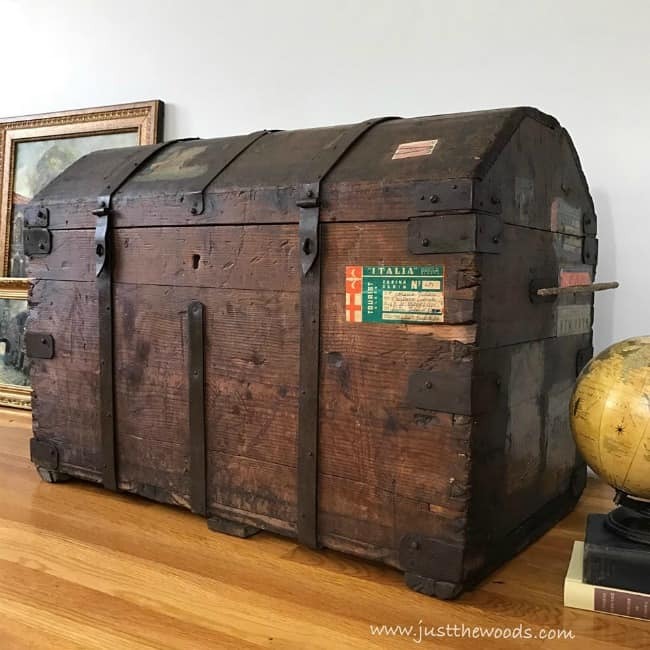 These sturdy wooden travel chests were popular in the late 1800s and early 1900s for those traveling long distances aboard these ships. 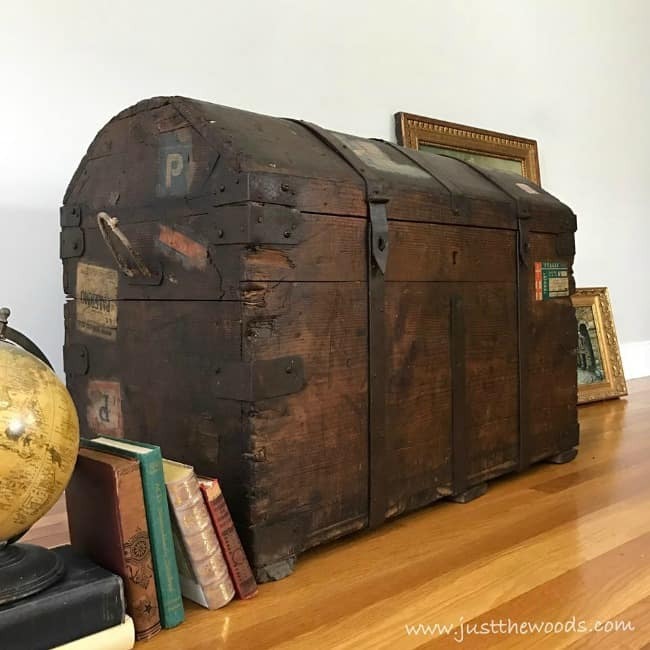 Which is exactly where this particular antique trunk came from. Disclosure: This post is sponsored by Wise Owl and contains affiliate links for your convenience. Click here for my full disclosure policy. 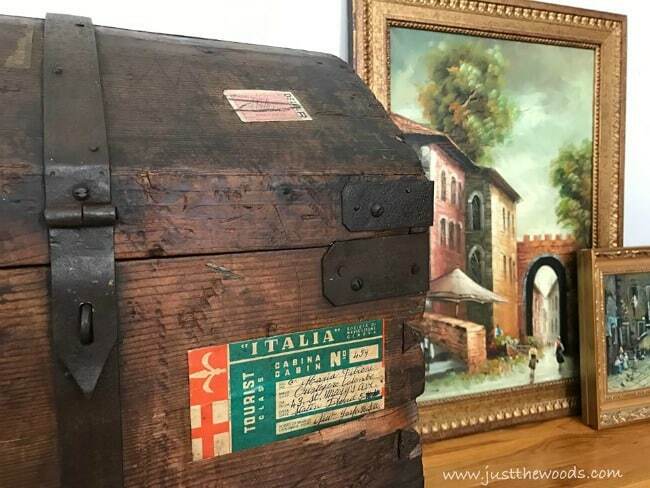 This old antique chest had been used by my husband’s great-grandparents as they traveled back and forth between Italy and Staten Island. Many of the vintage labels are still visible on the trunk. 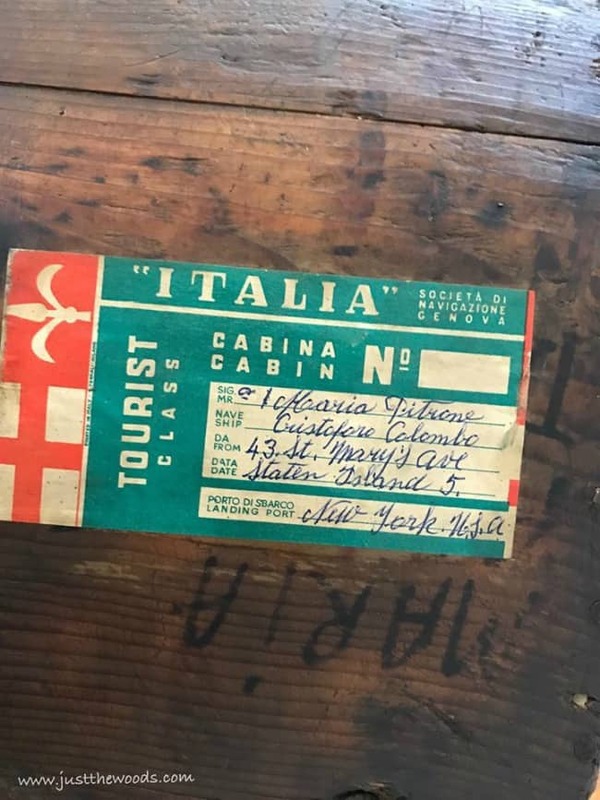 The multiple trips between New York and Europe took a toll on this wooden chest leaving evidence of its history as well, as making it that much more important to be restored. Let’s address these issues. First, you want to clean off as much of the dust and spider webs and basic yuck as you can. Grab your shop vac and thoroughly vacuum all of that crud off. Don’t forget to tilt the trunk or lay it down to get the underneath. 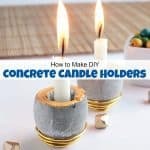 I avoid using the house vacuum for things like this and use a shop vac dedicated to these furniture projects. The thought of antique spiderwebs in the vacuum that cleans my living room grosses me out. If you don’t have a shop vac you can find one (here) Also, you want to remove some of the dust while not damaging the already delicate wood. Lightly brush the wooden travel chest with a dry paintbrush to ‘dust off’ the dust and dirt. I do not sand or scrub the wood. This step is a little harder than the first. 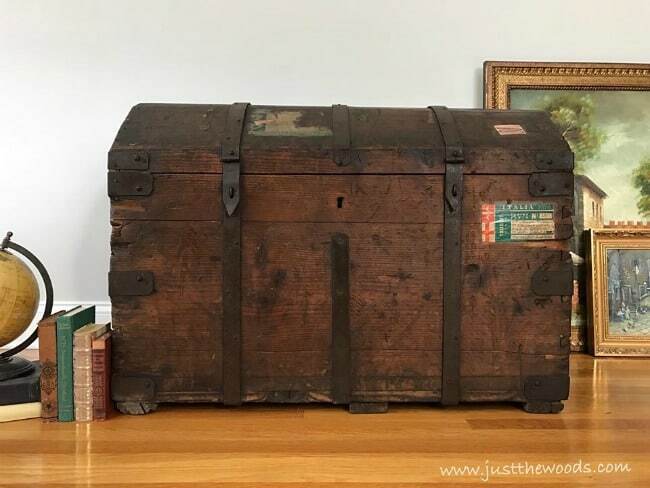 This antique steamer trunk started with such a strong mildew odor that I would not allow it into my home. 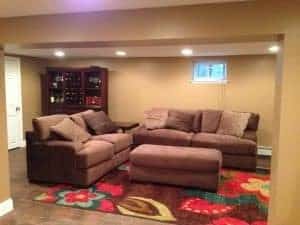 It had spent many years in a basement after all of its trips back and forth to Europe. Words can’t describe how bad it was. 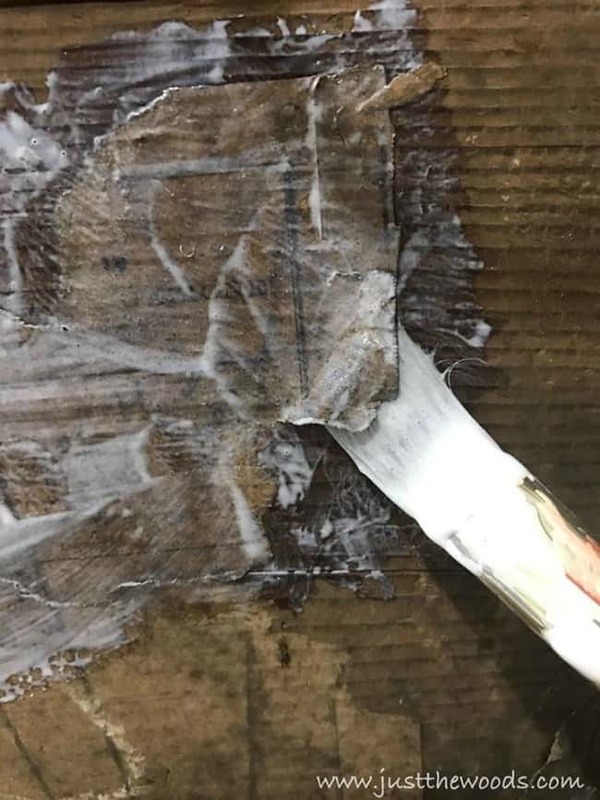 There are numerous methods for how to remove mildew smell from wood. Im sharing my method. 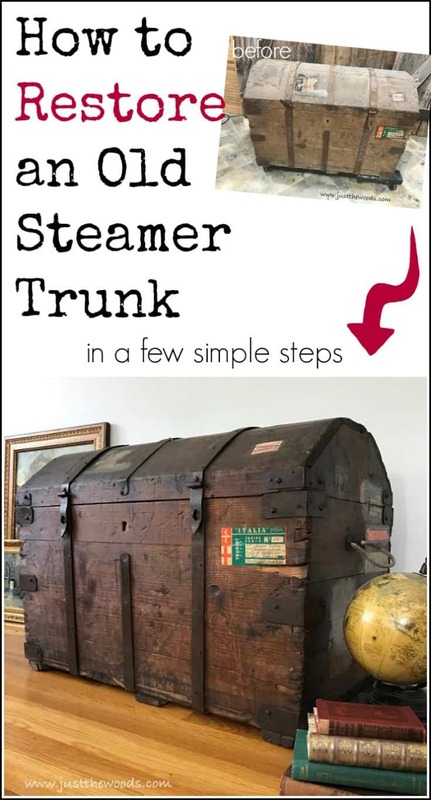 The first step to rid this large steamer trunk of the stench is to air it out. I left the trunk in my storage unit for a couple of months with the lid open before bringing in to the shop. This helped but certainly did not do the job completely. 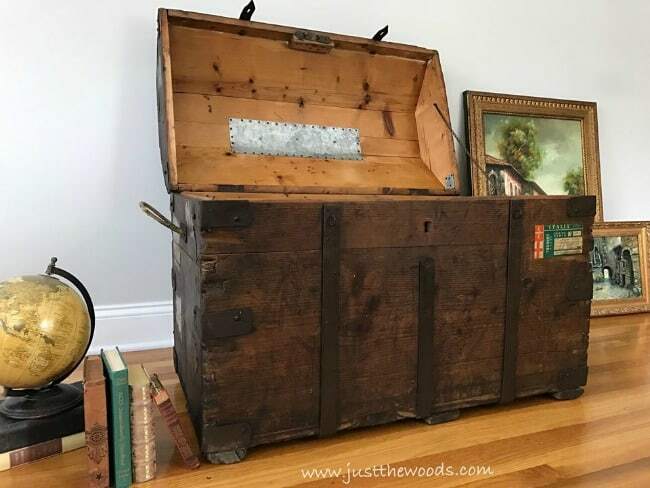 My next step is to spray the vintage steamer trunk with OdoBan. 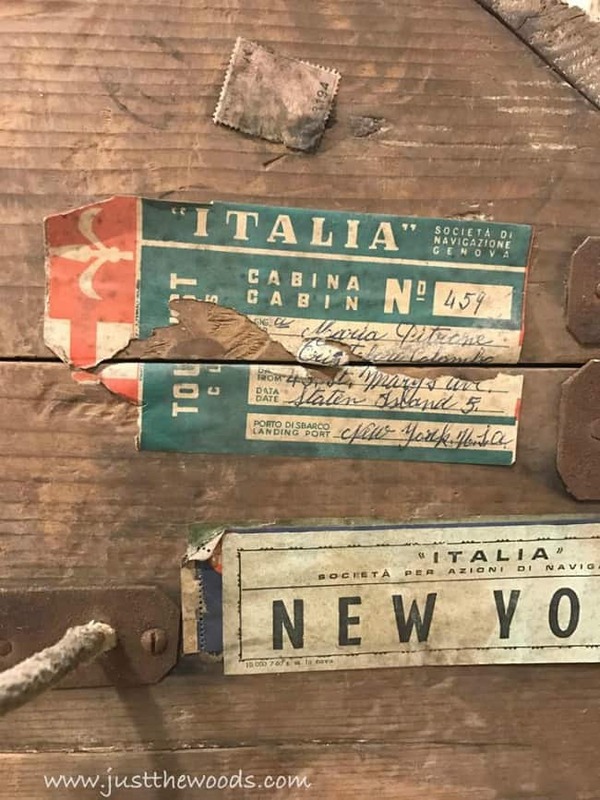 The vintage steamer trunk is covered in many of the original labels. Most are brittle and falling off. The goal is to safely preserve as many of these old labels as possible. 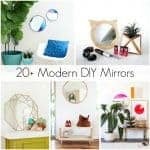 Grab your Mod Podge and a small paintbrush. Very gently apply the Mod Podge underneath the loose labels. Next, press the label down and apply more Mod Podge over the labels. 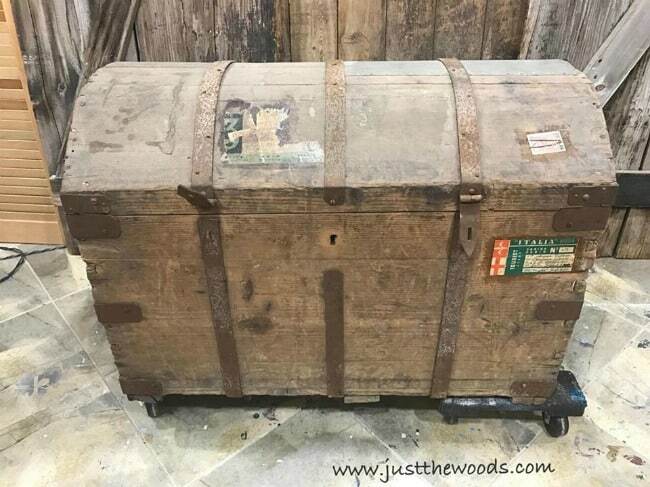 Now that the small obstacles are out of the way we can focus on the important part, the steamer trunk restoration. My good friend Thea has been raving about her Wise Owl Lemon Verbena and how great it smells and works. 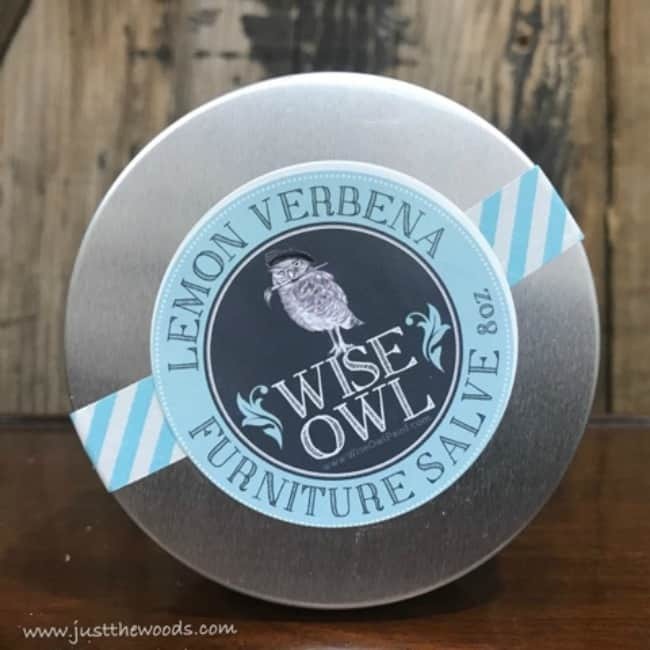 Wise Owl was kind enough to send me some Lemon Verbena Furniture Salve to try out for myself. If you’d like to try it too, you can get some (here). 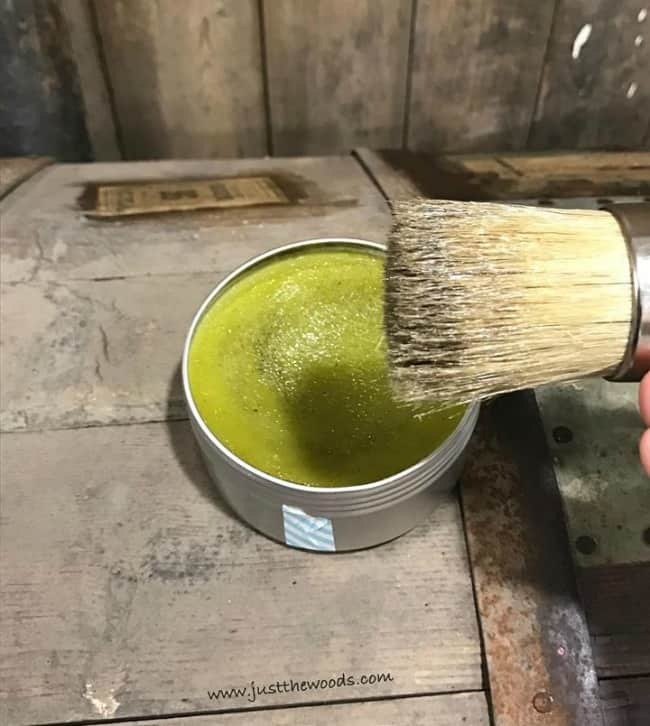 Since this is a furniture salve product I do not want to use the same brush that I would use with my paint. So make sure to use a brush dedicated just to this type of application. Im using a wax type brush. You can find this kind of brush (here). Using your dedicated brush apply the lemon verbena to the entire vintage trunk. 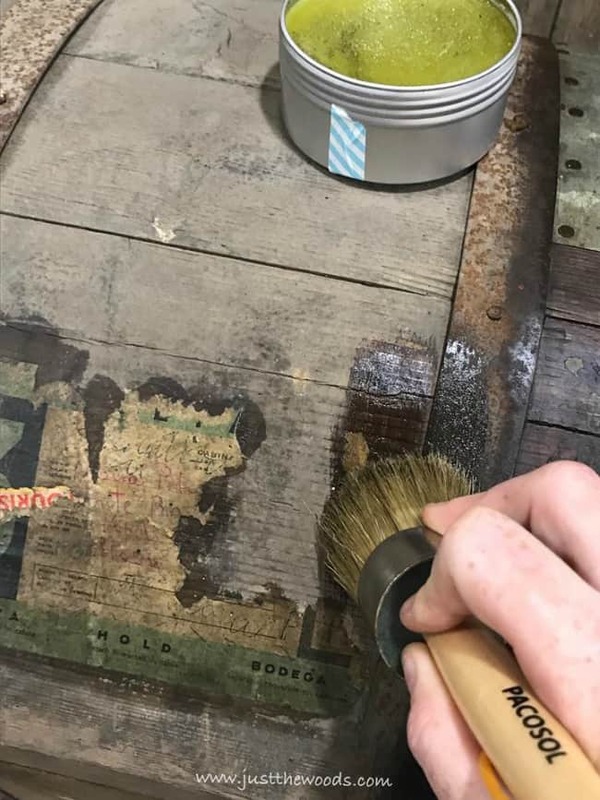 Work the furniture salve into the wood as well as gently applying over the labels. The Wise Owl lemon verbena conditions, seals and protects the wood. 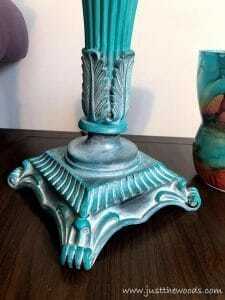 But unlike wax, it does not harden leaving a softer and heavenly smelling result. This furniture salve is made with hemp seed oil, natural waxes, cold pressed lavender essential oil and lemon verbena oils. Plus other awesome natural goodness that adds to the strength and superpowers of the salve. You can see here how much of a difference the verbena makes on the steamer trunk. What a difference, right? 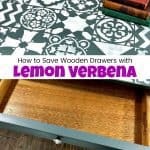 As an added bonus you can even use Wise Owl lemon verbena on the metal portions of the steamer. Here is a pre-recorded video done live on Facebook. It’s approximately 30 minutes long, but you are able to fast forward as needed or hang out for the whole video. Many questions can be answered by watching the video, or at least I hope they are. Once the Wise Owl verbena is applied to the entire steamer trunk make sure to go back and buff any excess salve with an old T-shirt. Especially on the metal areas since the product does not absorb into the metal. But here’s a fun fact: Apply and buff well where it’s very dirty to remove the oxidation from metal and remove dirt and debris. How cool! Click here to get Wise Owl verbena. 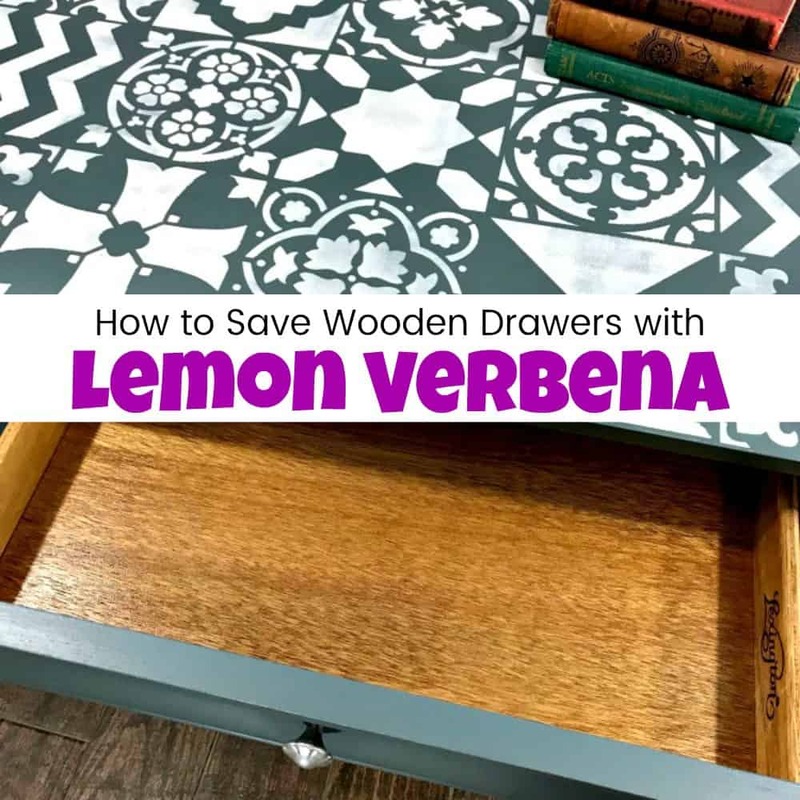 If you are a furniture restorer or furniture painter you should also check out How to Save Wooden Drawers with Lemon Verbena. How easy was that? Restored and revived while still preserving age and history. This refurbished steamer trunk can now continue on in our home. My only condition is that it does NOT get filled with toys! 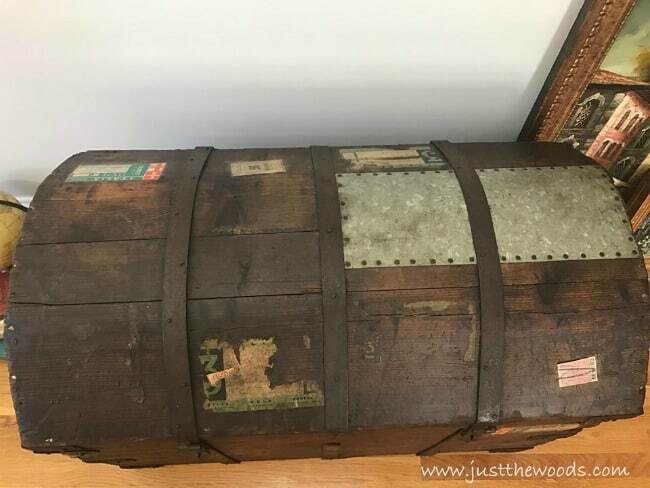 What a lovely old trunk! You did a great job restoring it’s old beauty. I’m glad that you were able to save the labels, that’s part of the history and beauty of the trunk. My husband and I both enjoyed the photos of the restoration of your trunk. 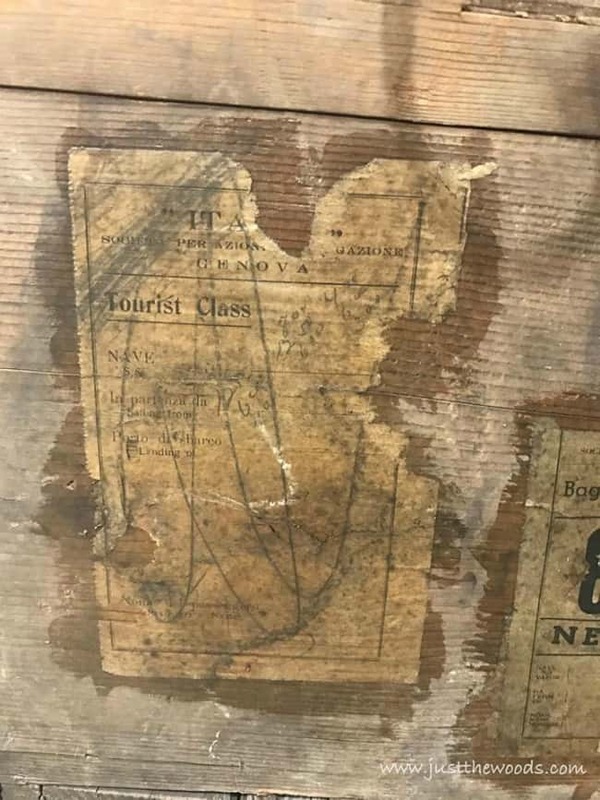 We are glad you were able to preserve the travel labels. This is now a lovely family heirloom. Thank you for sharing the photos and the restoration process. What are your recommendations regarding where to find replacement parts such as handles & casters? I have inherited my great grandmothers streamer trunk. But before I received it, it was painted black and now I am wondering how to get the black paint off and hopefully get it back down to the natural wood. Any suggestions would be helpful. You will probably have to strip the paint off. My understanding is that soy gel stripper is the safest product out there and works well top. Citristrip is another. I hope you’re able to save it! I cannot wait to buy this wise owl. What a beautiful piece. I have my grand mother’s trunk from 1904, when she immigrated to America from Finland. I’ve been looking for the perfect restoration answer, I believe I have found that answer right here. My question is, the entire inside of the trunk is covered with paper. I’m trying to decide if I want to leave it, or remove the paper. 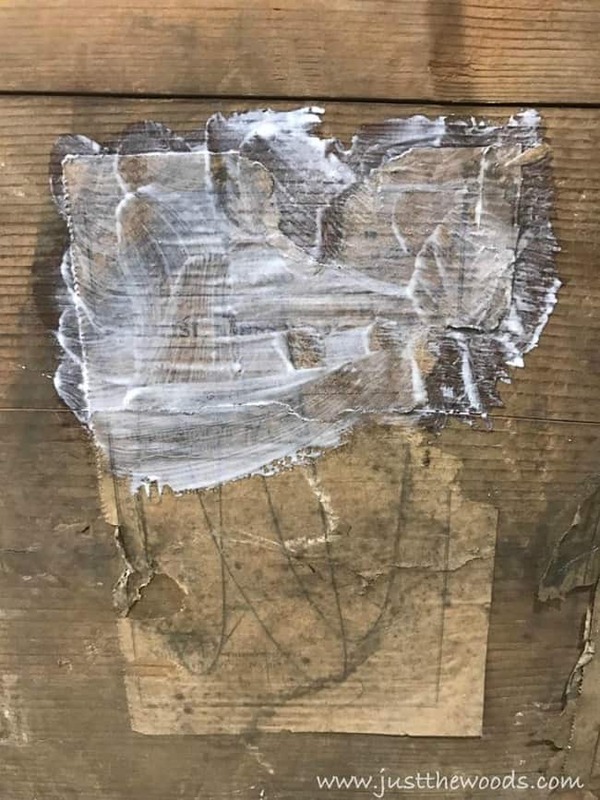 Will ModPodge help reinforce the paper and preserve it as well? Also, over the years of storage, someone put moth balls in the trunk, even though they are gone, the inside stinks from them. 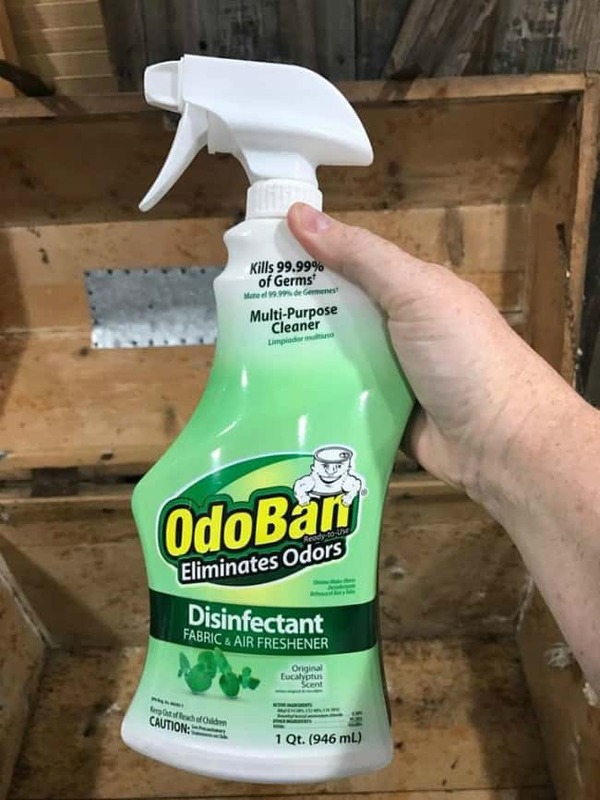 Do you think the OdoBan product will help eliminate that kind of odor? Also, I believe the lock does not work, I haven’t tried to push it into the locked position because no one in the family has the key to it. I don’t want it to be stuck locked. Any suggestions you have would be appreciated. Thank you. Hi! 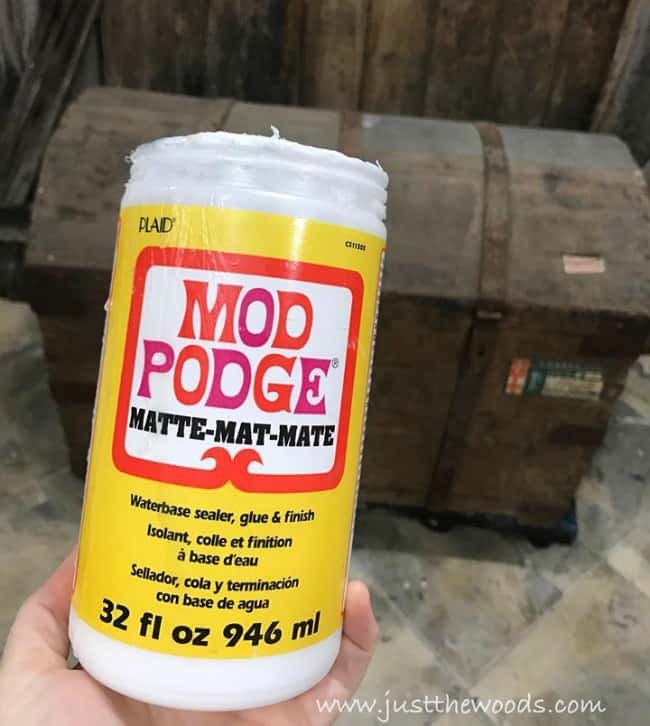 I would think that the Mod Podge would seal the paper inside the same way that it sealed the labels on the outside of my trunk. 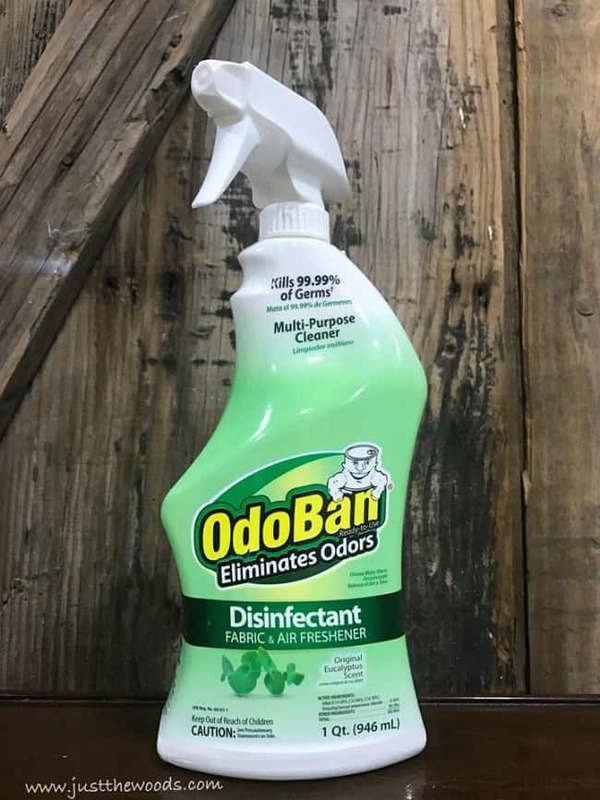 I also think the Odoban will help to eliminate the odor – but I did multiple light sprays over the course of a few days making sure to not drench the wood. So I would do the same for your trunk.. baby steps 🙂 .. as far as the lock is concerned Im really not sure. I would probably try to remove it or just not touch it out of fear of accidentally locking the trunk shut lol. 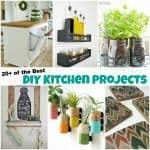 How big of a container of Wise Owl did you use for this project?